Did you ever have one of those days when you don't quite feel yourself, you're not sure why, and you push yourself to get a few things done? I always go over all my pills just in case I forgot one but I seem to have taken them all. Maybe it's just the rain and the thunderstorms we've been having all week. 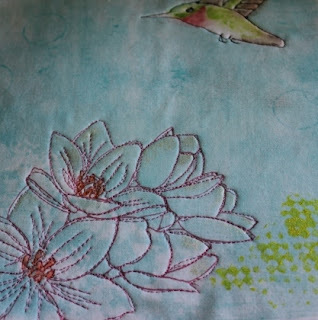 Anyway, yesterday, I got the binding on the second hummingbird quilt and as you can see, I've almost finished sewing it down. I promised myself that if I got two rows attached to each other on the quilt I'm trying to finish, that I could quilt for the day and curl up with my book. Not a good deal! I actually sewed the whole row and pulled out all the pins, only to discover that my needle hadn't been threaded! 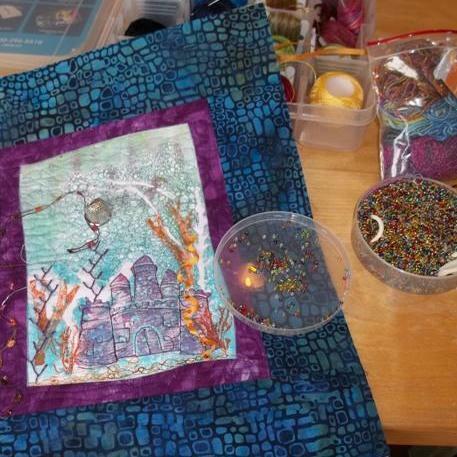 I re-pinned and resewed. There are two spots that I want to adjust but that will be for another day. 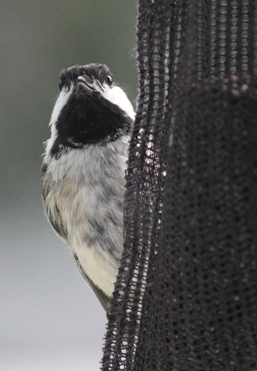 Aside form not feeling quite well, these chickadees that were flitting in and out to the feeder hanging on the window in front of my machine weer distracting me. 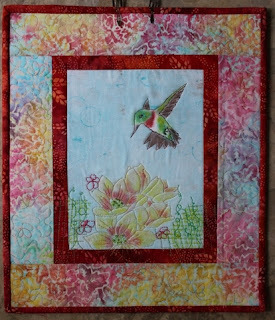 I am going to take a little break form my art quilting, just so you know, while I get this gift quilt finished. I cannot show it either, so I might miss some blogging for a bit. I'll see, I might feel the need to do a little creative work here and there. I finished this yesterday and took it to the shop today where I did my bit of volunteering for the week. I came home so tired I could barely make myself a cup of tea. 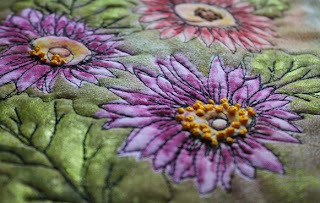 I am too tired to do some sewing, but thought I'd at least write a bit and show you my little daisy that I finished yesterday. As you can see, I chose a different binding fabric than the one I showed the other day, and I am quite happy with it. It gives it some life without taking over. I always find these little pieces are such fun to do. Maybe it's because there is less invested in them because of the size. 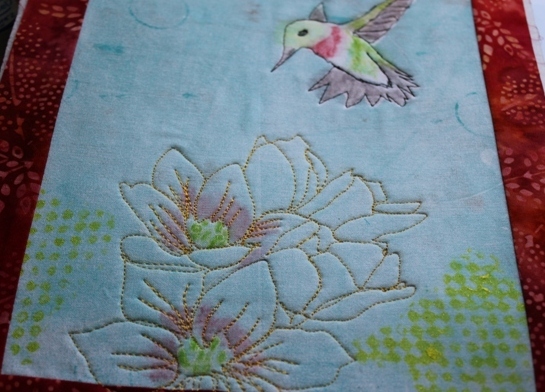 I'm definitely more relaxed as I'm free motion stitching. I need to learn to bring the same state of mind to the larger pieces. I feel the same slowed down state when I sit down with my hand sewing threads and beads. It is meditative. I like to open my windows and sew in silence except for the birdsong that floats in from outside. Although it is in the shop downtown and not on my Etsy shop, if anyone is interested in it send me an email. We got some rain last night, but so far today, although muggy, we've had none. I've spent most of my day, aside from an errand, inside doing some hand embellishing on two small pieces. I took a little break after lunch to help patch and spread some grass seed on a little piece of our front lawn. We are being invaded by ants and a skunk. Our next door neighbor has sprayed and laid moth balls, so I think even more have fled to our side. I find it surprising because because they do have a cat, albeit an indoor one, and the moth balls are toxic to small animals. We try to do everything as bio friendly as we can; there's not much one can do about the neighbors. I hate to think it could leach into my veggies. I finished the black thread sketching on this 4 by 6, postcard sized piece and added some beads and French knots to the center. 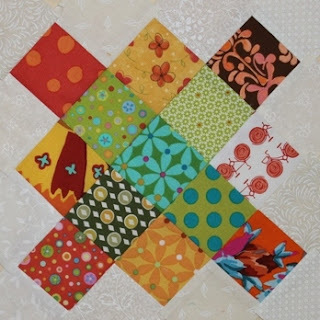 I may use this as the binding, but I could change my mind. 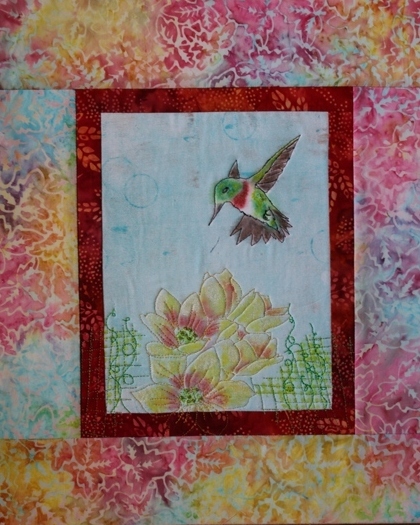 This piece is 8 by 8 inches, chosen because it meets the criteria of the Quilting Arts challenge I'm working on. 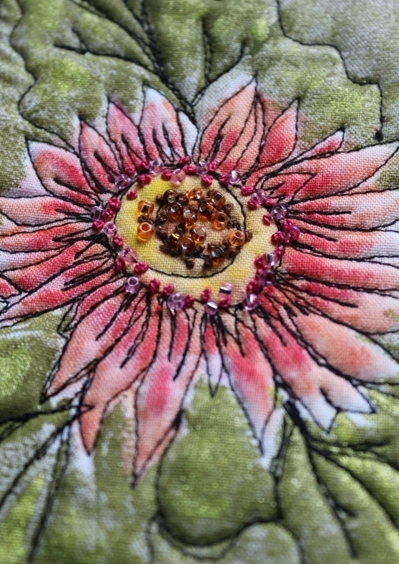 I may only use French knots in the middle, not sure about the beads. What do you think? I have a different border in mind for this. I'll show it next time. When I got home from Chal Baie today, this package of fabric was waiting in my mailbox. I picked them with a project in mind but they may not all end up there. I planned to get groceries on my way home, but it is warm again and I was feeling weak, so came home instead, made a cup of tea and retired to my studio with the fan. 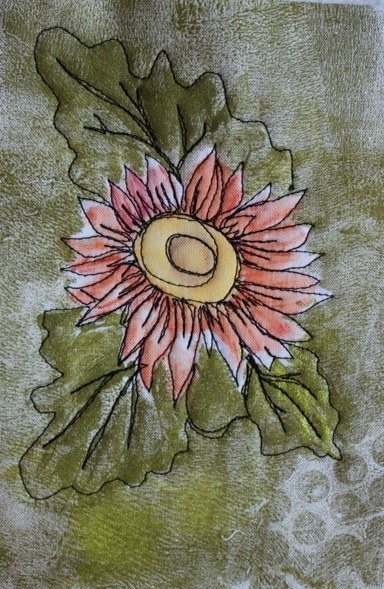 I did a bit of free motion sketching on this single daisy. It needs a touch up of paint but i thought I'd practice on it before going to the one with 3 daisies. I quite like the black; it makes it look similar to a sketchy pen and ink. I will be adding some handwork to it as well. 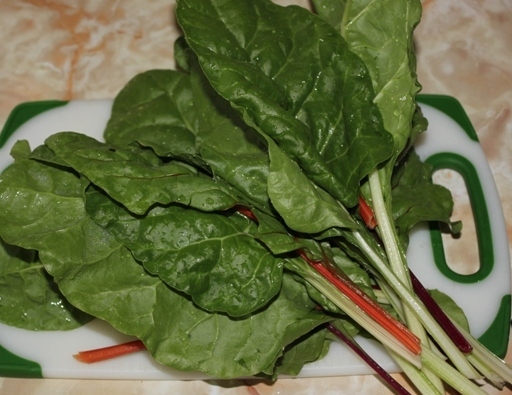 We are just beginning to enjoy the benefits of a home garden. My husband built me a small cold frame and the Swiss chard are coming along quite nicely. So delicious sauteed with with garlic, onions, chopped lemon balm, a splash of balsamic vinegar and a sprinkling of pine nuts. Today, I had the urge to play a bit with my Gelli printing plate. I chose the colors (green, pink and orange) in Setacolor fabric paints inspired by my pot of my pot of daisies on my deck, and then I cut some daisy shapes out of copy paper. 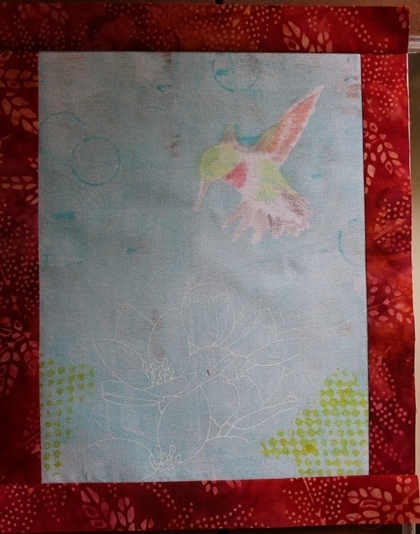 After rolling the paint onto the Gelli plate with the brayer, I laid down the paper flowers and then laid my piece of fabric on top and rubbed. I was having so much fun that I didn't think to take pictures of the process. This is what I ended up with. If you look closely, you can see some additional texture added in the form of leaf prints. I ran outside and grabbed a leaf. 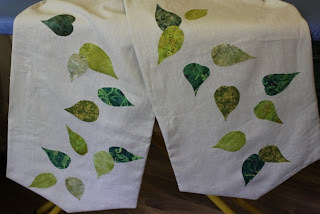 Then I carefully laid the paper masks in place on the printed fabric to keep paint from getting into the white areas. 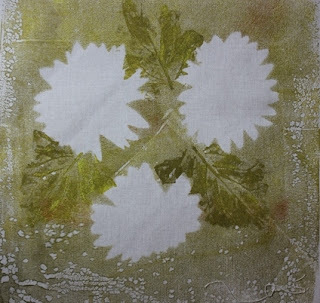 After painting the back of the leaf, I laid it down, put a piece of paper towel on top and rubbed. I hung them on the line for a bit--supposed to cure overnight but I was anxious to add some color. 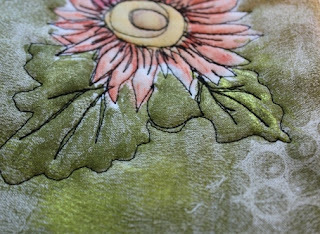 I used Neocolor II crayons for this step, spritzing the fabric first before coloring. You might notice the color that bled a little into the green. I don't mind that. Once I've added the stitching, it will hardly be noticeable and likely look like shading. 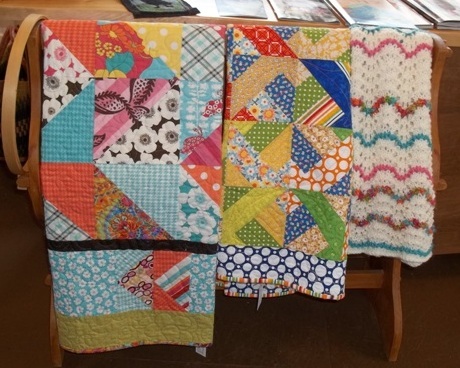 Have you come across the granny square block in your travels on blogs? I am smitten by this design. When done with fun colors, it seems like a modern design. 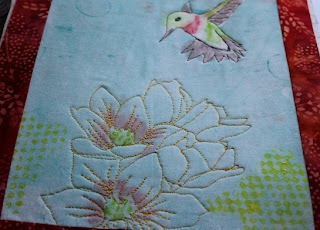 I put one together last night following the tutorial at Blue Elephant Stitches . I might try to do a block here and there and maybe I'll end up with a baby quilt. I've not trimmed this one yet. Here I sit in my studio on another warm sunny day, the fan running in the doorway, my little dragonfly chime in the window tinkling in the breeze. I am relaxed and quite comfortable for one who hates the heat. 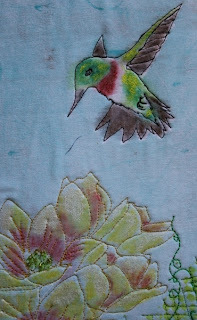 I added a few more little details to the first hummingbird piece-- bobbin work flowers in Candlelight sea foam blue. 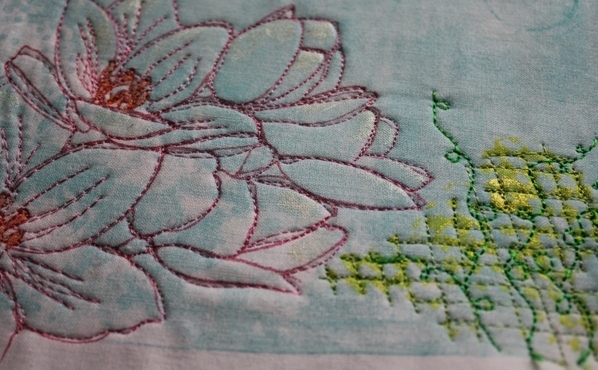 Then I hand stitched a few spots of white French knots. We don't have much available here in northern New Brunswick for fabric shops, so I rely on my meager stash. I think the binding works OK. I have the other hummingbird left to bind. Maybe I'll get to it tomorrow. 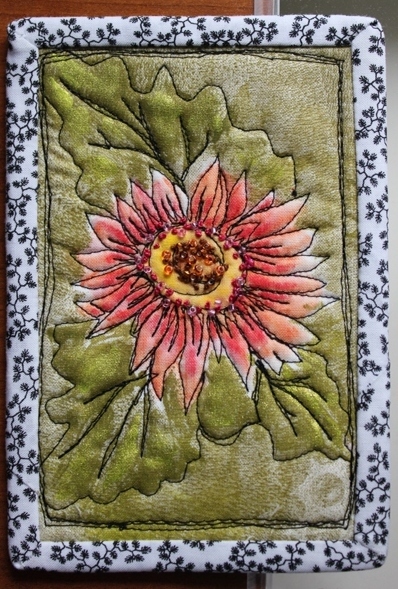 I'm shortly going to take a tea break and hand stitch the binding down. 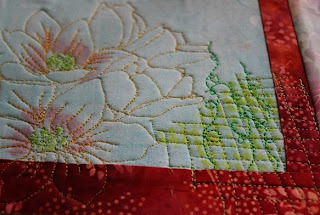 I'm linking today to the Needle and Thread Network for WIP Wednesday. It is another warm sunny day. I set the fan up in the doorway of my studio and it was quite pleasant sewing. 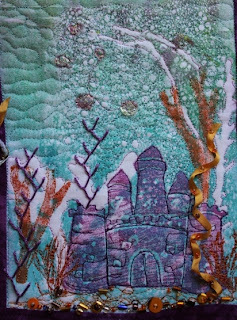 I've done the machine quilting around two of the 3 wall hangings that I've been working on, and I just sat down to stitch the binding down on the castle. My camera battery is charging so I took the photo with my I Pad! You can tell it's not as good as my camera or else I need to learn how to use it! 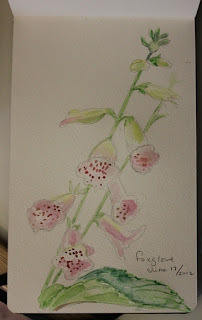 I always make apologies when I post my watercolor sketches because that is really what they are. I don't pretend to be an accomplished water colorist. I do not practice enough. 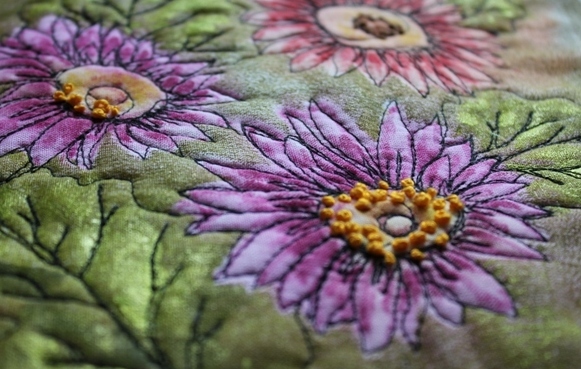 The different flowers will find their way into my fiber art. I dabbled a little this afternoon after my husband fell asleep on the sofa following his golfing this morning. The boys went out again today. I was going to meet them for the second nine but Gord was tired after all the golfing he's done. I am feeling weak and tired today, perhaps something to do with the yellow pollen dust that is floating around out there right now, so I opted out. 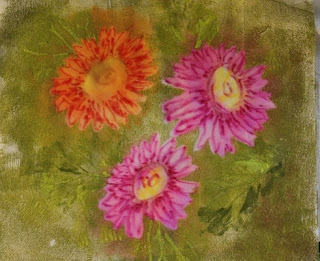 Rather than run the sewing machine, I thought I'd sketch my flowers which I just happened to have photographed last night. 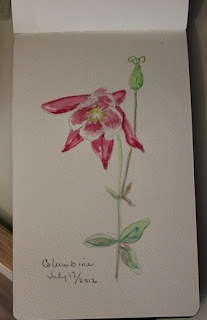 The first one is a columbine which reseeds and pops up all over the place. They are quite pretty and delicate looking. I just bought this foxglove. I've always loved them , tried them once before unsuccessfully, so we'll see. 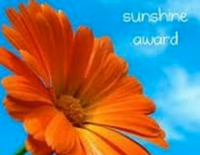 Favorite Flower: too many - cosmos, coneflower, cornflower, Queen Anne's lace to name a few. I didn't do much yesterday since my husband arrived home after working all week in Labrador and took the day off. I did my usual lunch with my friends but then spent the rest of the day with him. And last night my youngest son arrived with his girlfriend or the weekend. 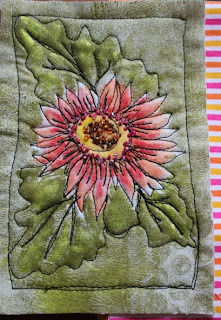 This morning the 'boys' went off to golf--too early for me-- so it gave me some time to do a little sewing after relaxing with my morning tea. 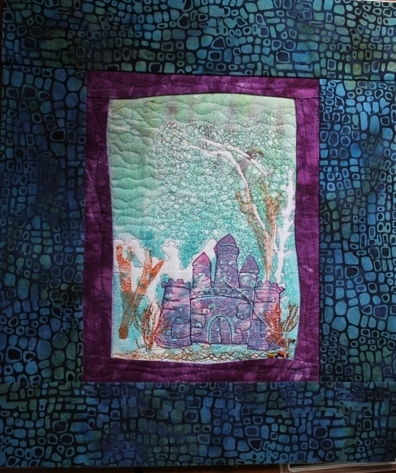 The castle I was working on is now ready for the quilting in the borders and the binding. I finished all the beading while at the shop on Thursday. I also added a bit more paint to the hummingbirds and the flowers. You can see that I decided to free motion quilt the background on one of them and then decided against it on the second one. I just finished adding the final borders to both of them. I think the narrow darker red stands out a bit but it should be OK when I add the matching binding. I'm ready now to do the final free motion quilting in the borders of all 3 pieces and then add the binding. I probably won't get to it now until Monday since my son is visiting. They'll be home hungry for lunch soon. We may take the kayaks and supper out to the beach, so he can visit with the grandparents and maybe get out for a paddle with his girlfriend. Tomorrow we all plan to golf. 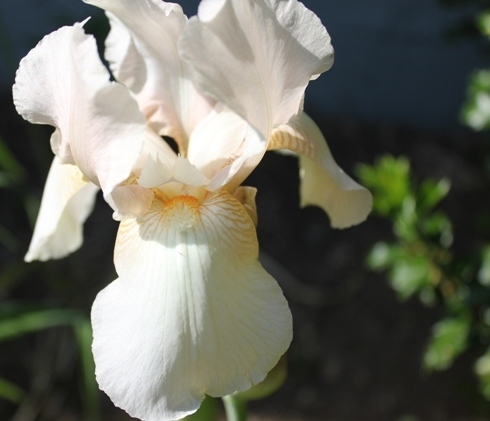 Yesterday i took a picture of my first Iris to open up. They are so delicate looking. 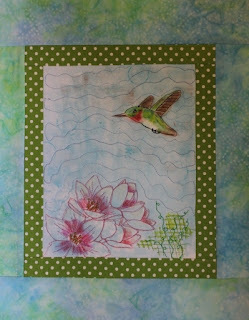 While I was doing my laps this morning at the pool, I was envisioning how I would finish up my two hummingbird pieces. I was looking forward to trying out my new Wonderfil thread for some curly vines, but that turned out to be a bit of a trial. 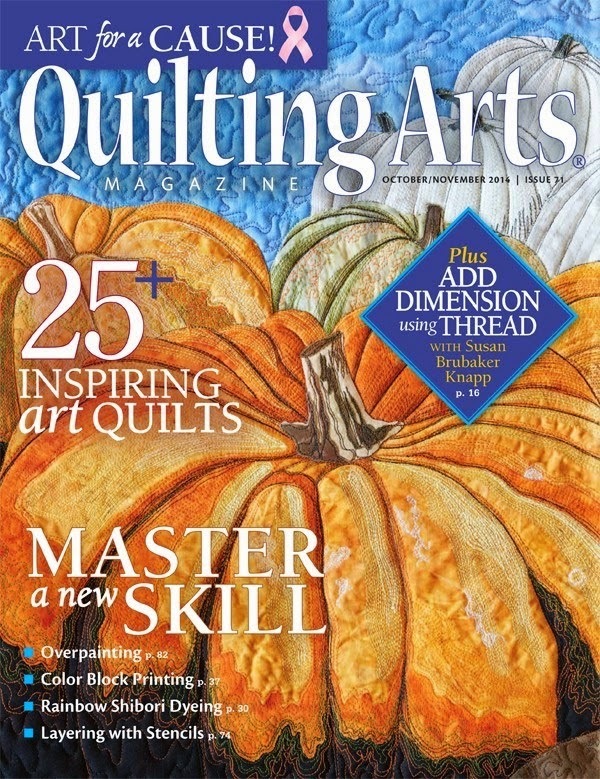 The thread kept shredding and breaking, so when I sit down later, I must do some more research on needles. I actually tried a metafil, a titanium and a jeans needle which is what worked. By the end, I was pretty frustrated. I've picked out the borders which I will add in the quilt as you go method. You can see a bit of them laid out below. 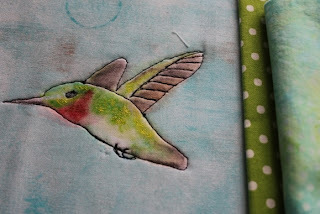 Next I added some iridescent paint highlights and darkened up the wings with Inktense watercolor pencils. They're looking better I think. 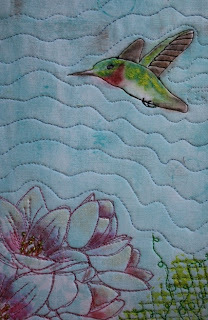 I'm trying to make up my mind about quilting the background space around the birds. 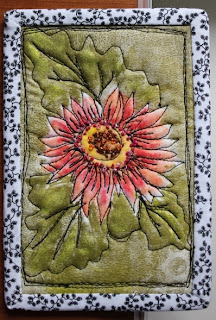 The Timtex gives such nice texture that I'm thinking it might be better to leave it blank so that the birds and flowers are even more showy. I'll have to think on it. I'm linking to the Needle and Thread Network for WIP Wednesday. go check out all the fun works in progress.. I had quite a lovely and busy day yesterday. I can survive on my own! My husband made it to Labrador City and we talked for a few minutes as he was exhausted. It was a 17 hour trip by road and ferry. I've finally realized that when I have my machine set up for free motion, it is much more productive to work on a few things with common colors at once. I did some outlining on both hummingbirds. 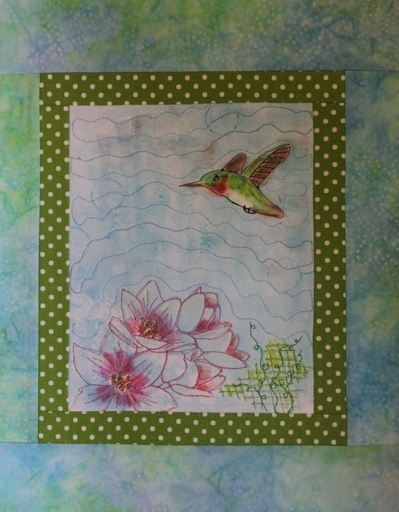 There are a couple of things I want to change on the birds and I will be adding more paint again too. I really like how the flowers turned out. I used Timtex this time and it seems to have given them some puffy dimension. I added 5 little bubbles cut from Angelina fibers to the castle piece. Around 2pm I took time out to have my walk and was able to sit on my deck swing with my tea and snack afterwards. There was a lovely breeze and not a fly to be seen. For supper, I pulled a homemade lentil burger from my freezer, warmed it and added cheese, lettuce, tomato and rhubarb chutney. I let it get a little too brown but it was still delicious. I also made the draw for my hand pieced star runner last night. I will be mailing it soon and will look for some updates on progress to show you . I'm actually excited to see what will become of it and how Linda will finish it. I lazed about in bed this morning after saying good bye to my husband at 5 AM when he left for Labrador City to work for the week. It is my first time being alone at night in years and it's definitely different that I'm not working. Also, today is Sunday when I'm used to him being around. On the bright side I don't have to worry about meals! I'm a little worried about being lazy! Have you ever noticed that when you have precious little time off, that it is an impetus to get more done? After completing the crossword puzzle with my tea, I did make a batch of my favorite granola this morning though. 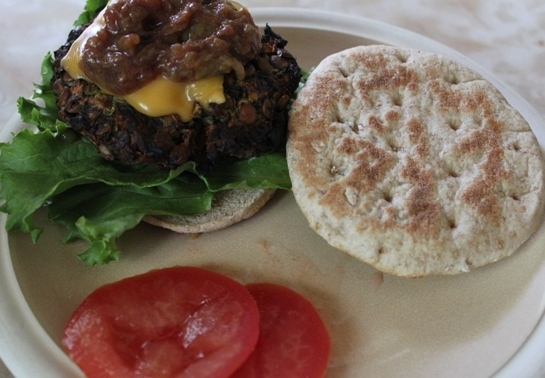 It is nutty and fibrous with just a touch of sweetness. 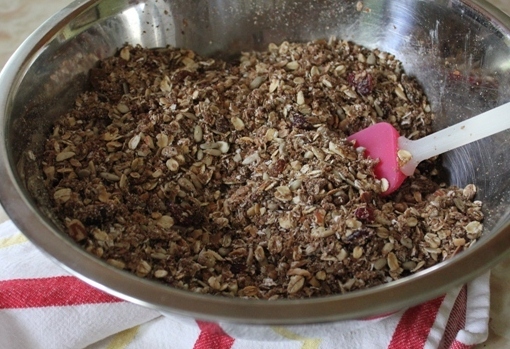 A lover of crunchiness, a sprinkle adds just the right touch on my fruit and plain yogurt at breakfast. Yesterday, I added the black stitching to my runner to finish it up. 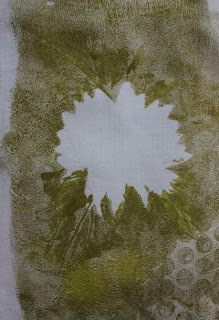 I liked all the various greens on the linen and I love the sketchy look of the black thread. However, in my predominantly beige living room, it doesn't add enough color. I've decide that some brighter cushions are needed and was tempted to start them right away. I'm going to be good though and finish some other projects first. I will make the small draw for my hand pieced stars to-night and let you know the winner tomorrow. 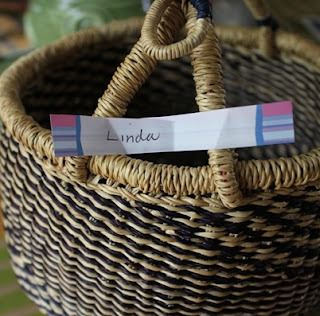 My husband isn't here to do the picking so I hope you'll trust me! 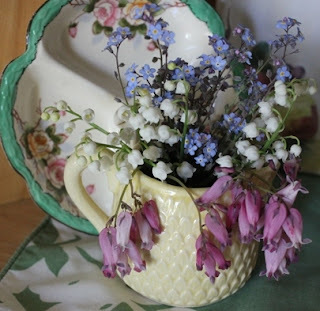 On my walk last night, I picked another little bunch of forget me knots. They're nearing the end. I just picked a few and added some lily of the valley and a few bleeding hearts. The little dish is one that came from my friend who is moving. When I got home after my Friday lunch date, I decided to pot up my last pot for my deck. The darn little black flies were so pesky that I danced, swatted and blew my way through it. I didn't spray myself like yesterday since I just had the one thing to do. Darn it one got me behind the ear. What else could I do? I retreated to my sewing studio. I got the 3 pieces for my runner cut-- top, flannel lining and backing, and then I sewed it together and turned it. The flannel lining is perfect though a little tricky to cut. 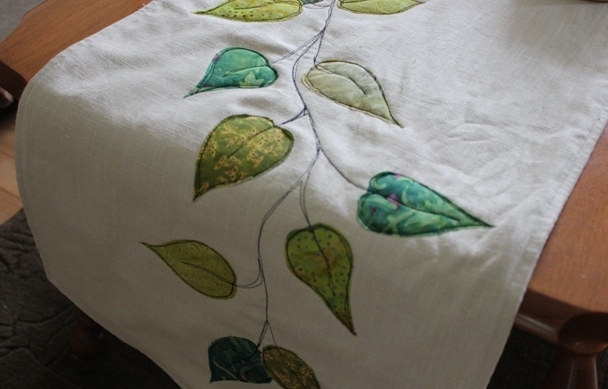 It was from a cheap sheet and kept stretching.I will top stitch the edge and then I want to do a free motion vine and stitch around the leaves, I think in black. I got two hummingbirds ready to stitch too. I added a border to the first one which you see here. 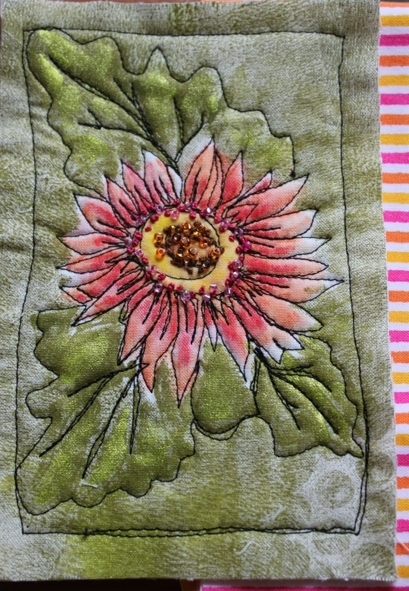 The second one I'm going to stitch and add borders later. I don't always know how the colors will end up. Once I do the outline stitching I will add more paint. 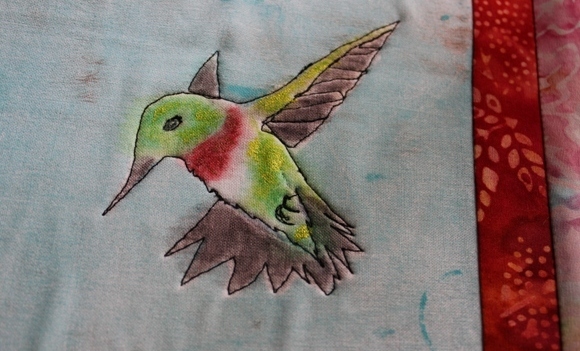 The color is a little faded here but with teh stitching and more paint it will start to come alive. The sun came out today and it was very welcome. I potted up some plants for my front step and the deck. After all those rainy days the black flies were out in swarms. I had to come in to get the bug spray. Gord wants to go hit balls to-night but I won't be going. I don't like it when the flies are thick. Probably I'll go for a little walk in our subdivision instead. I made a quick bookmark yesterday as a little gift for a friend. Also, today, I was in the craft shop, Chal Baie, at the waterfront and I took a couple of pictures of my stuff. I should have taken another one because we rearranged and added a couple more things afterwards--my runner for one. 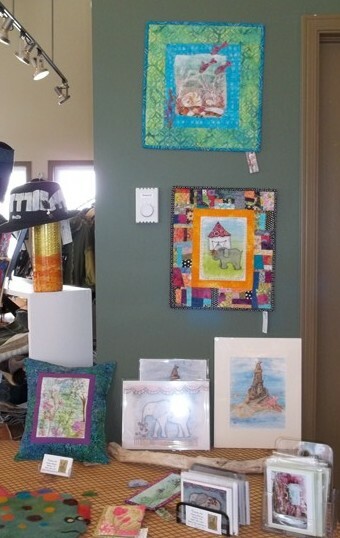 My quilts and an afghan are together on a quilt rack. 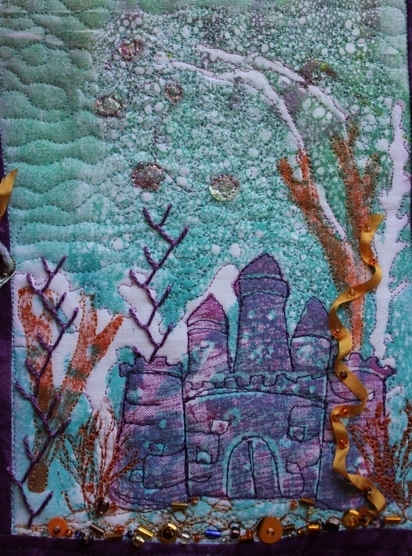 I took a supply of perle cotton, beads and fibers and worked on my castle while I was there. 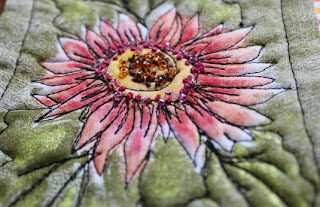 Adding all the final embellishing is my favorite part and really gives it life it think. I've a bit more to do on this. 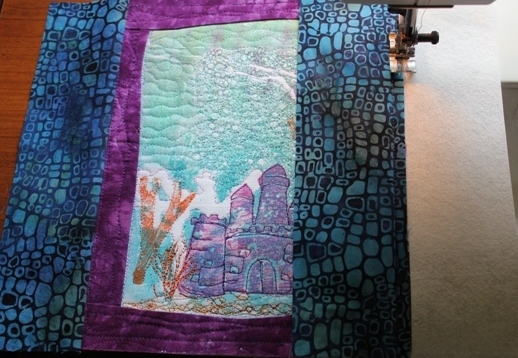 Yesterday, I finished hand sewing the binding down on this runner. It's all done! I didn't get any other sewing done because I went out for part of the day to help my moving friend. It has inspired me though to clean out some of my own things! I have this bit of handwork that has been hiding away in my closet. It was going to be a small quilt; then was revised to a runner, and now I no longer have the desire to finish it. Is there anyone out there who loves to do handwork who would like it? The last seam for the runner is almost done. The pieces to finish it are in the bag. If your interested leave me a comment and I'll draw names if there is more than one. I'll leave it open until Sunday the 10th. 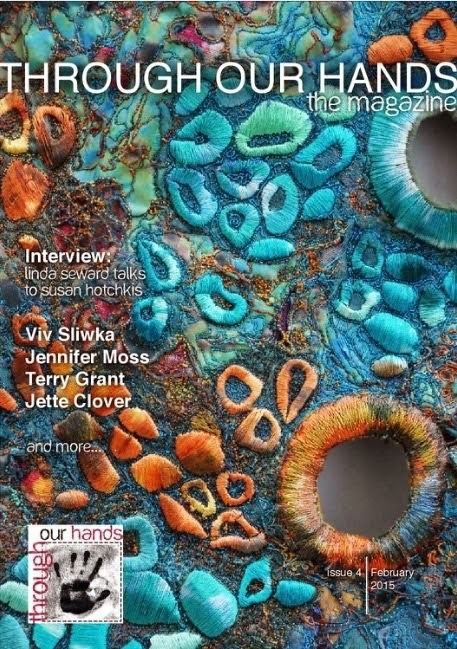 I'm linking to the Needle and Thread Network. 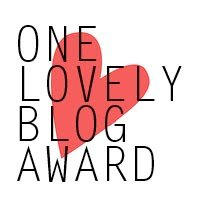 Go check out all the great blogs. 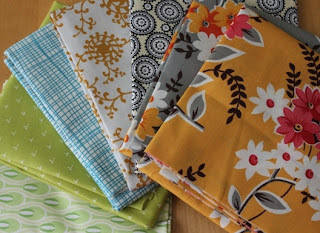 I took the advise of some of you and went looking for fabrics in my stash for the runner. I found a backing fabric and I found some flannel. 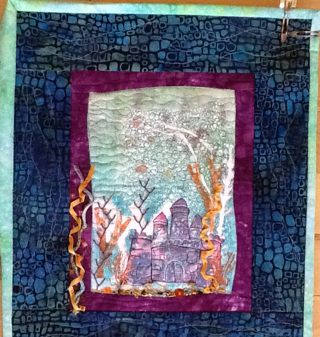 It was a piece left over form a pair of sheets that I bought when I made my design wall. It is cream colored so will do nicely. I wasn't sure if it had gotten washed, probably, but I put it in anyway. So while I wait for that, I've been doing a few other things. 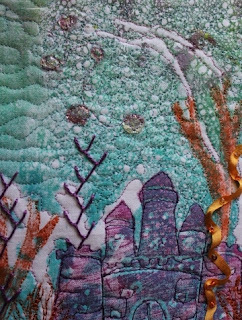 Some of my readers will remember the castle with the wrinkle which ran when I attempted to iron it out after dampening the fabric. 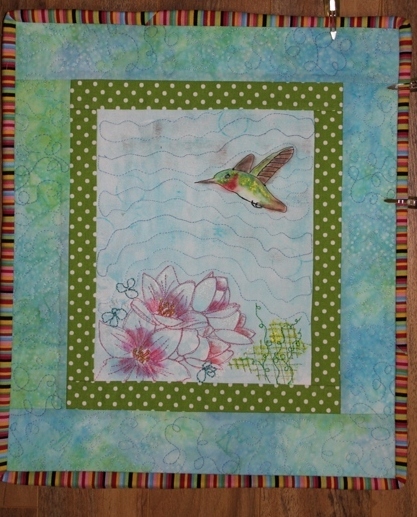 I cut the stained border off and added a new one using the quilt as you go method. 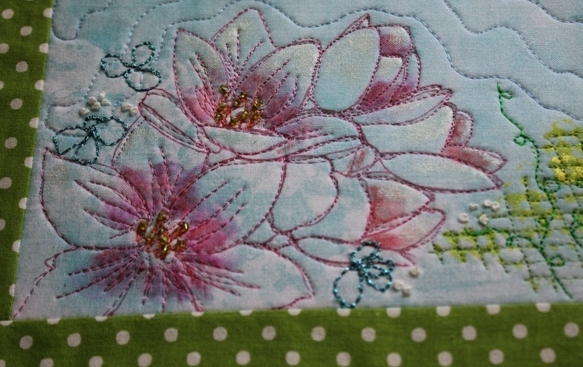 Here you can see the 2 side borders sewn on. The right hand one is still folded back and I have butted a Timtex up against the seam and zig zagged it. After that I added the top and bottom borders the same way. Now it is ready for some hand embellishing and beading. I will take it to the shop with me to work on while I'm there. 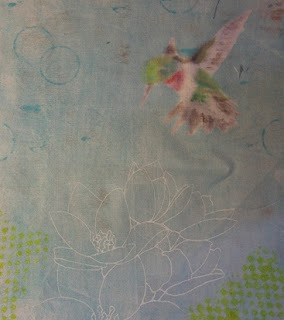 I pulled out another hummingbird mono print and added the first layer of color with a paint brush and Inktense pencils. you might remember this first one that I did. The other thing I did that I've wanted to do for a while is to sew 2 sample blocks for the quilt I will do my brother and his wife. I found the directions at Love Laugh Quilt. 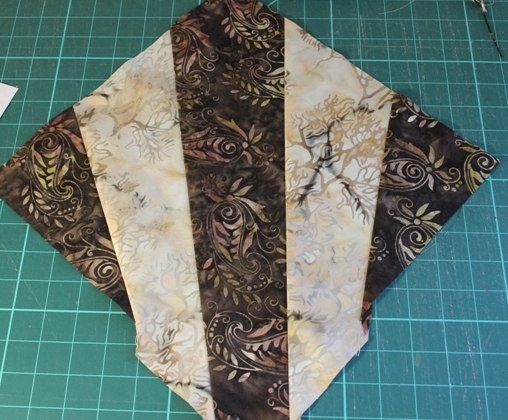 Even though you can't see it, I layered two fabrics together and sliced, swapping out the fabrics for each block. I cut them 13 3/4 inches. 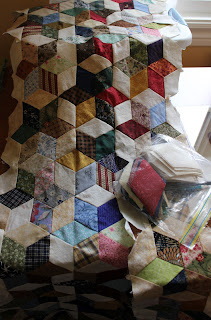 They look like this when sewn together, so once trimmed they were about 12 inches. They will not be next to each other once more blocks are made.